SPOOKY tape recordings of US military men investigating a UFO in British woodland 30 years ago have finally been released. It became one of the world’s most famous UFO sightings – and has never been explained. November 2, 2010 – The tape begins with an American noting that local farm animals were behaving strangely. He says: “They’re very, very active, making a lot of noise. “Straight ahead. There it is again. Straight ahead. What is it? A strange, small red light. He continues: “I saw a yellow tinge in it too. Weird. It’s coming this way. It’s definitely coming this way. The servicemen were led by Colonel Charles Halt, of the local US Air Force Bentwaters base. He reported the December 1980 incident to the Ministry of Defence. Damage to trees was later found 18ft high. Theories range from an accident cover-up to lighthouse beams. TAPE recordings of US airmen investigating a potential UFO landing shed more light on one of Suffolk’s greatest unsolved mysteries. 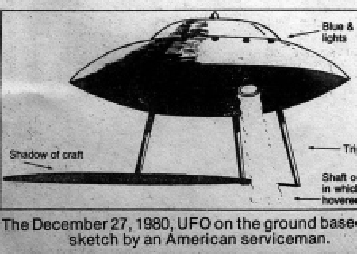 November 2, 2010 – The 30th anniversary of the Rendlesham Forest “incident” is fast approaching. The East Anglian Daily Times and BBC Radio Suffolk want to find out what really happened and have joined forces in a bid to unearth the truth. The tape recordings are a vivid account of what personnel from the nearby USAF Bentwaters air base discovered when they went to investigate in the dead of the night just after Christmas 1980. The men were led by Colonel Charles Halt, who was second in command at the base, and it is clear they thought they were witnessing some type of phenomena – with descriptions of “strange” lights in sky and odd damage to pine trees 15-18ft off the ground. The tape continues: “I hear very strange sounds of farmers’ barn yard animals. They’re very, very active, making a lot of noise. “Straight ahead. There it is again. Straight ahead. What is it? A strange small red light. It looks maybe half a mile further ahead. Go back to the edge of the clearing, see if we can get a look at it… the animals have gone quiet now… It is deathly calm. Despite endless speculation, there has never been a definitive answer to what actually happened that night. Thank you for sharing your interesting experience with us anonymous . may I ask what you were doing outside in the middle of the night alone and what time was it when it happened ? Can you recall and draw any of the symbols that you saw as well ? Thank you and much appreciated .